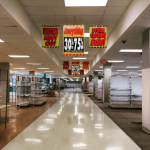 Many retail stores are shrinking their footprint or declaring bankruptcy. In part, it’s because online sales have been rising by an astonishing 17%/year for two decades and are now 9% of all retail sales. Moreover, there are 24 square feet of retail space/person in the US; tops in the world. Canada has 17, followed by Australia at 11, then the UK and Japan at 4.5. More bricks-and-mortar pain ahead.